GO FOR BROKE: A PICTORIAL HISTORY OF THE JAPANESE AMERICAN 100TH INFANTRY BATTALION AND THE 442ND REGIMENTAL COMBAT TEAM by Chester Tanaka (Presidio Press, 1997). 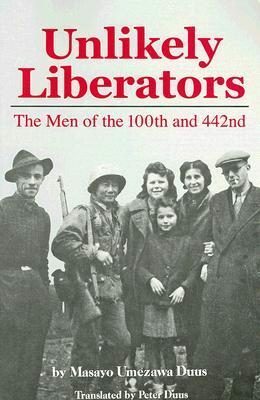 UNLIKELY LIBERATORS: THE MEN OF THE 100TH AND 442ND by Masayo Umezawa Duus and translated by Peter Duus (University of Hawaii Press, 1987). PERSONAL JUSTICE DENIED: REPORT OF THE COMMISSION ON WARATIME RELOCATION AND INTERNMENT OF CIVILIANS. The Report was originally published in 1982 and 1983. A 1997 Reprint by the University of Washington Press and the Civil Liberties Public Education Fund is also available. A LESSON IN AMERICAN HISTORY: THE JAPANESE AMERICAN EXPERIENCE from the Japanese American Citizens League. The Guide includes: more than 100 pages of photographs; a summary of Constitutional violations; Japanese American history; lesson plans and activities for students K-9; list of related resources. For ordering and more information, contact: Japanese American Citizens League, 1765 Sutter Street, San Francisco, CA 94115-3217; 415.921.5225.